The BP Portrait Award is upon us and just keeps getting better each year. If you haven’t been yet you still have time as it closes on September 18th. I can only describe the exhibition as a real treat for your eyes that showcases portraitures comeback. The works go from quite sketchy to hyperrealism, case in point ‘ Perspiration and Pores ‘ by Jan Mikulka is a mind boggling study. This portrait of a mans head shows off the artists talent, skill, and craft to breaking point. You’ll probably wonder as I did, how long it took to produce or as I overheard someone say ” being so lifelike why not just get a photo blown up “. Well on that last point I disagree, this portrait shows not only that a painting can stand toe to toe with photography, but I think it goes further as its almost frightening to see that a human hand is capable of such striking detail. It’s a genre of art that stops you and holds your gaze as long as it wants, cause you have that ” wait a minute ” moment when you realise your looking at a painting, which I think is part of the purpose of art..to make us witness the Divine….anyway enough of my preaching lol ; ). My favourite portrait by far in the exhibition was Louis Smith’s ‘ Holly ‘ which only came second. Somehow the name Holly doesn’t seem to quite fit how monumental this epic portrait is! Then again its a modest simple name for a grandiose portrait which is kinda cool. I mean its like looking at the artists work of a lifetime an its called Holly ?!? Well after I did my double take at the name, I spent the most time standing in front of this scene trying to unravel the story an detail. What puts this portrait far beyond all the other work is the fact thats its a nod to the Renaissance. The world created by the artist is mysterious, sexual, foreboding and tense the naked woman is breathtaking and looks to me like she’s almost in a trance like state, waiting for the inevitable. Its so beautifully painted this will definitely stay with you once you leave. 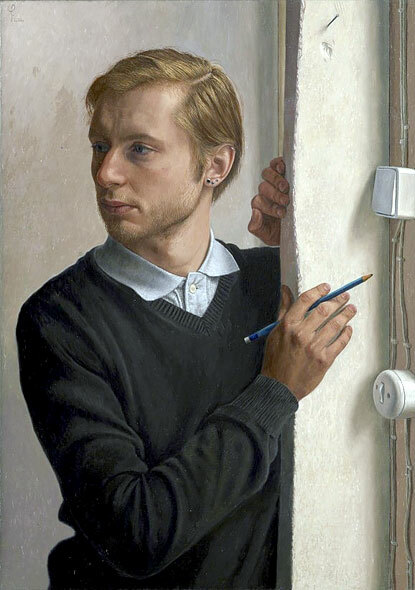 The winner of the BP Portrait Award though was Wim Heldens whose portrait ‘ Distracted ‘ is magnificent! The hair detail is definitely a highlight. This portrait is so plane that it shows portraiture at its pure roots, just capturing what the artist sees. It’s almost an anticlimax but it shows everyone who will see it that portraits don’t have to be overcomplicated and worked to perfection cause at the end of the day none of us are perfect, the honesty in the piece is what portraiture should be really about. What a good way to leave the exhibition and a worthwhile message for anyone with a vague interest in art or wanting to do it as a hobby or for a lifetime. BP Portrait Award 2011 at the National Portrait Gallery, WC2 (020 7306 0055, npg.org.uk) until September 18. Open Sat-Weds, 10am-6pm, Thurs-Fri, 10am-9pm. Admission free.